Native island species are predisposed and vulnerable to local extinction by invaders. 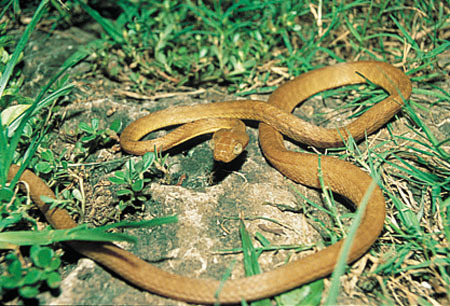 When the brown tree snake (Boiga irregularis) was accidentally introduced to Guam it caused the local extinction of most of the island’s native bird and lizard species. It also caused \"cascading\" ecological effects by removing native pollinators, causing the subsequent decline of native plant species. The ecosystem fragility of other Pacific islands to which cargo flows from Guam has made the potential spread of the brown tree snake from Guam a major concern. \r\nB. irregularis is rear-fanged and mildly poisonous. The snake’s venom trickles into a bite victim along grooves in the rear fangs; because of the relatively small size and position of the fangs, a brown tree snake must chew to allow the fangs to penetrate the skin (USDA-APHIS 2001). The brown tree snake will readily strike when aggravated, but it does not present a danger to adults. A bite from this snake will not penetrate most clothing, Both constriction and venom are used to help immobilize prey (USDA-APHIS 2001), and babies less than 6 months old may be at risk from both brown tree snake bites and constriction (USDA-APHIS 2001). A young victim of a brown tree snake bite should receive immediate medical attention. Further information on reporting brown treesnake sightings is available at the \r\nUSGS Fort Collins Science Center site. Young snakes hatch from eggs in approximately 90 days. In Papua New Guinea where it is native, B. irregularis occupies a wide variety of habitats at elevations up to 1200 meters. It is most commonly found in trees, caves, and near limestone cliffs, but frequently comes down to the ground to forage at night (Fritts & Leasman-Tanner 2001). It hides during the day in the crowns of palms, hollow logs, rock crevices, caves and even the dark corners of thatched houses near the roof (Fritts & Leasman-Tanner 2001). Based on frequent mention of this snake in relation to buildings, domestic poultry and caged birds, the snake is common in human-disturbed habitats and second-growth forests (Fritts & Leasman-Tanner 2001). In part of its native range in Indonesia, it is found in tropical evergreen forests, montane forests, lowland tropical forests, mangroves, montane savanna, wet savanna, seasonal dry forests and closed shrubland. It is also found in human-modified environments, such as deforested land, grassland and croplands (coffee, rice, rubber, coconut, tea and maize cultivations). 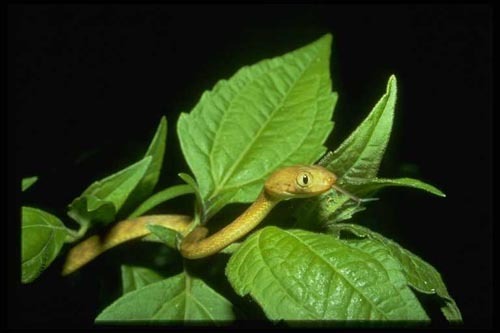 \r\nOn Guam, this secretive, nocturnal, and often arboreal snake is found in all terrestrial habitats, but is especially common in forests and human-modified environments (Rodda et al. 2002). The brown tree snake spends most days coiled in a cool and dark location, such as a treetop or a rotted log; it often takes refuge in Pandanus sp. trees (Hetherington et al. 2008). Snakes sighted in the Northern Mariana Islands occured in freshwater swamp forests, herbaceous wetland vegetation, tropical montane savanna, coastal strand vegetation and mangrove forest and in human-modified environments. One puzzling result of brown tree snake reproductive studies is that reproductively active males appear to be relatively rare; this is surprising, because female reproductive activity occurs at all times of year in brown treesnakes (F. J. Qualls & C. P. Qualls Unpub. Data, Aldridge 1996 1998, Rodda \r\n\r\n\r\n\r\n\r\n\r\n\r\n\r\n\r\net al. 1999c, in Rodda et al. 2002). From an adaptive perspective, one would expect males to be able to take advantage of mating opportunities at whatever time of year they encounter a receptive female. Yet reproductively-active males are relatively rare in samples of brown tree snakes (which are collected primarily with food-baited traps). One possible explanation for this phenomenon might be that snakes that are reproductively active are refractory to trap capture. Snake breeders report that male snakes in general avoid eating while they are in reproductive condition (N. Ford Pers. Comm., in Rodda et al. 2002). Review: Dr. Gad Perry, Associate Professor, Conservation Biology Texas Tech University, USA. Recommended citation: Global Invasive Species Database (2019) Species profile: Boiga irregularis. Downloaded from http://www.iucngisd.org/gisd/species.php?sc=54 on 19-04-2019. Reduction in Native Biodiversity:The brown tree snake has decimated Guam’s birds and herpetofauna, causing the local extinction of over half of Guam’s native bird and lizard species as well as two out of three of Guam’s native bat species (Savidge 1987; Rodda & Fritts 1992). Several indigenous or endemic species of lizards have become extinct or engangered because of snake predation (Rodda & Fritts 1992). Guam's 12 forest birds were especially impacted, with 10 species eliminated and the other two severely reduced (Rodda & Savidge 2007). By eliminating native pollinators the brown tree snake has also caused \"cascading\" effects on Guam ecosystems, reducing pollination by lizards and birds and reducing native plant regeneration and coverage as a consequence (Perry & Morton 1999; Mortensen, Dupont & Olesen 2008). Preventative measures: In 1993 Wildlife Services (WS) and the US Department of Agriculture began a programme to reduce the potential for snakes to enter Guam's transportation system (see Engeman et al. 2002; Vice et al. 2005b). WS has taken the primary role in this effort through trapping, oral toxicants, fence line searches and the use of BTS detection dog teams (Stanford & Rodda 2007). Traps: A variety of modified crawfish or minnow traps have been used on Guam to trap snakes (Rodda et al 1999; Vice et al 2005a). Trapping snakes with live-mouse lures is the principal control technique for this invasive species on Guam (Gragg et al. 2007). It is estimated that approximately 2500 snake traps have been placed on the island (Rodda et al. 2002). Barriers: Multiple studies have examined the use of barriers for blocking brown treesnakes (Rodda et al. 1998; Perry et al. 2004). Rodda and colleagues (2002) found it possible to create small, predator-free nature reserves using a combination of snake barrier and trapping methods (Rodda et al. 1999a). Campbell (1996, in Rodda et al. 2002), eliminated brown tree snakes from two one-hectare plots and found that lizard species showed a dramatic increase in abundance compared with similar snake-inhabited plots; within a year their numbers roughly doubled. The Campbell barriers brought attention to two acute problems: typhoons and rats. Rats chew holes in all things chewable and Guam is subjected to irregular but severe cyclonic storms which may damage barriers (Rodda et al. 2002). Chemical: One component of brown tree snake management on Guam is the use of a toxic bait that consists of acetaminophen tablets inserted into a dead newborn mouse, which in turn is placed within a cylindrical polyvinyl chloride bait station suspended above ground or fitted with a tiny parachute so that it drifts into trees (Avery Tillman & Savarie 2004; Savarie et al. 2005; Westbrook and Ramos 2005). Possible hazards to nontarget species, especially the Mariana crow (Corvus kubaryi) which ingests mice, are of concern but appear to be limited (Avery Tillman & Savarie 2004). Thermal: Brown treesnakes can be killed by excessively cold or hot temperatures, and several studies have examined the use of thermal fumigation. Under normal handling conditions, passive thermal fumigation might have some benefits, but is not a complete solution (Perry & Vice, 2008). Biological Control:\r\nHistorical evidence shows that the biological control of vertebrates is fraught with unacceptable risk. Cane toads and poisonous red-bellied black snakes may prey on the young of the brown tree snake occasionally but the introduction of either could conceivably cause more problems than it could potentially solve (Caudell et al. 2002). Integrated Pest Management (IPM):\r\nConservation actions on Guam should be directed towards an improved recruitment via artificial pollination and planting of flora indirectly impacted by the brown tree snake (see Ecology Page Impacts information from Mortensen et al. 2008). Restoring conditions for natural pollination or managing reproduction of vertebrate-pollinated plants is critical in the long-term conservation of native vegetation types on Guam (Mortensen et al. 2008). Efforts are now underway to conserve the few remaining larger areas of uniform forest vegetation, e.g. the conservation action plan Guam Comprehensive Wildlife Conservation Strategy (2005). Informations on Boiga irregularis has been recorded for the following locations. Click on the name for additional informations. D Evelyn, S.T., Tarui, N., Burnett, K. & Roumasset, J.A. 2008. Learning-by-catching: Uncertain invasive-species populations and the value of information. Journal of Environmental Management. 89: 284-292. Fritts, T. H. 1987. Movements of snakes via cargo in the Pacific region. Elepaio 47: 17-18. Fritts, T.H. & D. Leasman-Tanner. 2001. The Brown Treesnake on Guam: How the arrival of one invasive species damaged the ecology, commerce, electrical systems, and human health on Guam: A comprehensive information source. Summary: This book summarizes the state of knowledge as of 1999 - a nice and broad compilation that lists just about everything else of use to that date. Shivik, John A.; Savarie, Peter J.; Clark, Larry. Aerial delivery of baits to brown treesnakes. Wildlife Society Bulletin. 30(4). Winter 2002. 1062-1067. Stanford, J.W. & Rodda, G.H. 2007. The brown treesnake rapid response team. USDA National Wildlife Research Center Symposia: Managing Vertebrate Invasive Species. United States Department of Defense. 2008. Report to the Congress: Control of the Brown Tree Snake (BTS). Summary: The U.S.Geological Survey has assumed a central role in studying the biology of the brown tree snake, the problems it can cause and alternatives for control. USGS researchers are also examining how ecological health is jeopardized on Guam and other islands. Vice, D.S. & Vice, D.L. Characteristics of Brown Treesnakes Boiga irregularis removed from Guam s transportation network Pacific Conservation Biology. 10(4). 2004. 216-220. Wiles, G. J., Bart, J., Beck Jr. R. E., and Aguan, C.F., 2003. Impacts of the Brown Tree Snake: Patterns of Decline and Species Persistence in Guam�s Avifauna. Conservation Biology, Volume 17, No. 5. Summary: Impacts of brown tree snake on endemic species in Guam. Fritts, T.H. & Rodda, G.H. 1998. The role of introduced species in the degradation of island ecosystems: a case history of Guam. Annual Review of Ecology and Systematics 29: 113�140. McCoid, M. J. 1991. 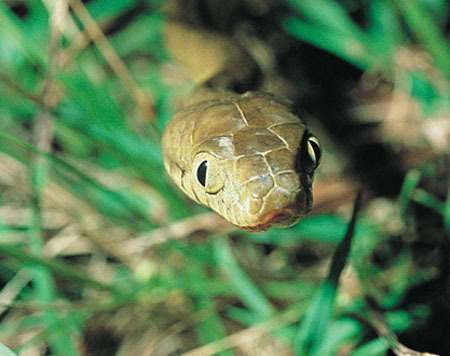 Brown tree snake (Boiga irregularis) on Guam: a worst case scenario of an introduced predator. Micronesica 3: 63�69. McCoid, M. J., Stinson, D. W. 1991. Recent snake sightings in the Mariana Islands. Elepaio 51: 36-37. Perry, G. 1998. Brown treesnake update. Aliens 8: 6�7. Perry, G. & Morton, J.M. 1999. Regeneration rates of woody vegetation of Guam�s Northwest Field following major disturbance: land use patterns, feral ungulates, and cascading effects of the brown treesnake. Micronesica 31: 125�142. USDA-APHIS (United States Department of Agriculture - Animal and Plant Health Inspection Services). 2001. The Brown Tree Snake Factsheet. Vice, D.S., Linnell, M.A. & Pitzler, M.E. 2005b. Draft summary of Guam s outbound cargo handling process: preventing the spread of the brown treesnake. U.S. Department of Agriculture, Animal Plant Health Inspect. Service, Wildlife Service, Barrigada, Guam. Wiles, Gary J.; Bart, Jonathan; Beck, Robert E. Jr.; Aguon, Celestino F.. Impacts of the brown tree snake: Patterns of decline and species persistence in Guam s avifauna. Conservation Biology. 17(5). October 2003. 1350-1360. National Wildlife Research Cebter, Hawaii Field Station, PO Box 10880, Hilo, HI 96721, U.S.A.
4512 McMurry Ave., Fort Collins, CO 80525, U.S.A.
1060 Route 16, Suite 103C, Barrigada Heights, Guam 96913, U.S.A.